Long before BURNTmd became a successful MC and music promoter, he was 5-year-old Brent Kauffman, selling baseball cards on the beaches of Brooklyn. Now 31, he has since worked through a difficult adolescence marked by insecurity, drugs and crime to reconnect with his enterprising spirit. The onetime Vermont rapper’s latest album, Not So Black & White, comes after 13 years free from addiction. It features an impressive lineup of hip-hop luminaries such as Planet Asia, Madlib and Def Squad’s Keith Murray, the last of whom BURNTmd will join for a homecoming appearance at the Higher Ground Showcase Lounge this Thursday, July 26. “My journey has had a lot of obstacles to overcome,” he says simply. BURNTmd attributes his bourgeoning success to hard work and perseverance. Now a resident of Denver, Colo., the entrepreneur has launched GTD Entertainment — a multifaceted A&R company that records, promotes, consults and distributes all things hip-hop. Artists who have worked with GTD include Snoop Dogg, George Clinton and Game. BURNTmd founded the company in Burlington, where he landed after a series of false starts. Throughout his tribulations, however, a passion for writing, performing and production never left him. BURNTmd says he discovered his musical talents when he was 14, living in New Jersey and emulating the MCs he’d see at raves. “You know, growin’ up and listening to music, everyone sings a song they like. But some people want to go and sing their own song one day,” he says. 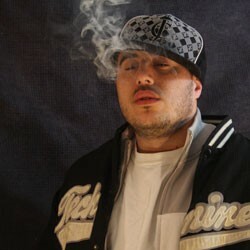 He cites Bone Thugs-n-Harmony, Notorious B.I.G., Funkmaster Flex and Cypress Hill as early influences. Writing, he says, was a better form of expression than acting out how he felt. BURNTmd adds that he found the quick drum-and-bass tempo of the electronic scene congenial to his lyrical flow. “I think fast,” he says. After establishing a confident writing voice, the MC says it took years to perfect a blend between his content and delivery. Uncomfortable in “the dirty Jerz,” Burnt says he mellowed his negative experience with drugs, only to find himself temporarily homeless during high school. Cajoled by his concerned parents, BURNTmd joined the NAVY, or “Never Again Volunteer Yourself,” as he quips, when he was 19. His brief stint in the military ended after he failed a drug test that a recruiter had promised he wouldn’t have to take for a month after signing up. The erstwhile cryptology trainee soon found himself hitchhiking to Burlington from his father’s cabin in Stowe. Vermont, he says, turned his life around. He learned to coordinate events, and propelled himself vigorously into the flourishing music scene here. “When I first got there, Liquid Energy was going on,” he says, referencing the now-defunct Church Street café and nightclub. Having some booking experience from a production company he had started during his New Jersey rave days, called Stay Away Productions, BURNTmd was soon bringing local rappers together while honing his craft at Metronome and Higher Ground. His streetwise attitude, however, was not always particularly embraced. Eventually BURNTmd’s Vermont hip-hop confederates helped him find a balance without abandoning his voice and style. After his Burlington adaptation, a local guitar player, Chris Kyle, heard BURNTmd at a Loomis Street house party. Kyle, who BURNTmd says was “very, very drunk” at the time, insisted he meet his roommate, Danny Mansion. Mansion and BURNT hit it off, and the former ended up producing one of the MC’s most successful tunes, “Stormy Mondays,” along with many others. Mansion also appears on the latest release. Not So Black & White offers BURNTmd’s reflections on growing up as a religious and ethnic minority in the tristate area. The MC, who is Jewish, says he frequently got into fights and constantly questioned why race and ethnicity create such barriers. He says he prefers asking questions in his songwriting, rather than making statements. One of those questions was asking Keith Murray to work with him. The former Def Squad founder and notoriously rambunctious MC has become a frequent collaborator. Nastee, a respected local rapper and producer in his own right, reveres his rhyming ally for his exceptional business sense. The upcoming Higher Ground show will mark BURNTmd’s first return to town since hosting a benefit at Burlington bar Ruben James in May. Inspired by his stint with philanthropy, he decided to host what he’s calling the Vermont Free Ticket Giveaway. To be given to patients, volunteers and donors. Thirty-five free tickets to his concert are being distributed, via the radio station Planet 96.7, to the American Cancer Society. Local businesses, including the Spirit of Ethan Allen III, Full Tank, Jivana Holistic Spa, Third Shift Clothing, Wild Life and the Village Sweep, were willing to sponsor his idea immediately, he says. Keith Murray with BURNTmd play the Higher Ground Showcase Lounge in South Burlington on Thursday, July 26, with DJ Dakota, Lynguistic Civilians, Learic, Nastee & S.I.N., Memaranda, KS Boyz and more, 8:00 p.m. $12/15. AA.